Oregon has many volcanic landscapes, found in scattered locations in the desert southeast and all along the Cascade Range; most famous is Crater Lake National Park, and there are other accessible areas around McKenzie Pass along Hwy 242, and at Brown Mountain, west of Klamath Falls. The easiest reached location is either side of US 97, south of Bend; an arc of lava flows, cinder cones, lava caves and other features stretching over 30 miles, originating from the caldera of Newberry Volcano, which like Mount Mazama at Crater Lake exploded with huge force, 75,000 years ago, leaving a ring of low peaks around a large crater. Also like Mount Mazama the caldera is flooded, but here only partially, forming two lakes (Paulina and East), separated by a tree-covered pumice cone. 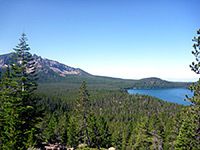 The surrounding cliffs are much less prominent than at Crater Lake, yet the surroundings have a greater variety of geological features, and provide more recreational opportunities. Although the majority of the caldera is very old, it does contain the most recent lava in Oregon, the Big Obsidian Flow, which was produced only around 1,300 years ago. Partly because of this relatively recent eruption, Newberry Volcano is considered potentially active, though current signs of subterranean heat are limited to a few warm springs around and beneath the lakes. Newberry Caldera and its associated lava flows are protected by the 50,000 acre Newberry National Volcanic Monument, created quite recently (1990) and managed by the US Forest Service rather than the National Park Service. 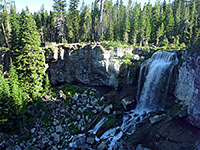 The monument is almost entirely surrounded by the Deschutes National Forest, and contains generally forested land, ranging in elevation from 3,800 feet at the Deschutes River to 7,985 feet at the summit of Paulina Peak, the highest point along the caldera rim. All is covered by snow for about half the year yet some sites are still accessible, and the place is very popular in summer, especially the area around the two lakes, even if the majority of visitors are here for camping, boating and fishing, rather than hiking or geology. Beside the lakes are half a dozen campgrounds, a resort and a lodge, plus 55 miles of trails. The other easily reached section of the national monument is along US 97 near Bend; here are found the longest lava tube in Oregon (Lava River Cave), open to self-guided exploration, and Lava Butte, a symmetric cinder cone surrounded by fresh lava fields. This location also has a campsite, and the Lava Lands Visitor Center, the main information facility in the monument. Unpaved roads cross other parts of Newberry National Volcanic Monument, including a 9 mile route to the Lava Cast Forest. This is a section of lava flow that 7,000 years ago enveloped a grove of ponderosa pines, forming moulds of the trees; the wood has long since decayed leaving circular holes, some at the center of small mounds formed by lava building up around the base. The cast forest may be toured by a one mile trail, and is little visited compared with the two developed areas. 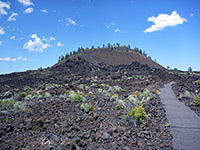 Other backcountry access is provided by FR 9710 (Paulina Lake Road), which runs all along the east edge of the monument, passing lava deposits and cinder cones.